Luis Ortiz may have begun his 2018 ring campaign with a loss to Deontay Wilder, but he wants to end the year with a firm reminder that he’s still very much in the heavyweight mix. The Cuban southpaw is making the most of life after his first career defeat, having suffered a 10th round stoppage at the hands of Wilder in their title fight thriller this past March. Having already rebounded with a 2nd round knockout of Razvan Cojanu in July, Ortiz (29-1-0-2NC, 25KOs) will close out 2018 with a December 1 showdown versus Travis Kauffman. Their bout will take place at Staples Center in downtown Los Angeles, gracing the Pay-Per-View undercard of Wilder’s latest title defense as he faces undefeated Tyson Fury in a battle of unbeaten heavyweight behemoths. The bout will be Ortiz’ fourth in exactly 52 weeks after having sat out nearly all of 2017 for a variety of reasons. The 39-year old heavyweight—who lives and trains in Miami—joined Haymon’s Premier Boxing Champions family early last year, but stumbled out the gate in making his debut. An untimely injury earlier in the year and a clerical error on his VADA paperwork leading to his planned Nov. ’17 clash with Wilder being postponed left Ortiz inactive since a stoppage win of David Allen in Dec. ’16. He finally returned to the ring last December, scoring a 2nd round knockout of Daniel Martz in Hialeah, Florida, minutes from his adopted hometown. The win was predictable, but came with the cavaet of building toward a rescheduled date with Wilder, who was seated ringside as a guest commentator for that specific portion of the FS1 telecast. The two jawed at one another inside the ropes, paving the way for their eventual clash this past March. Ortiz gave Wilder all that he could handle but was dropped and eventually stopped in suffering his frst loss since 2008 when he was still an amateur in Cuba. 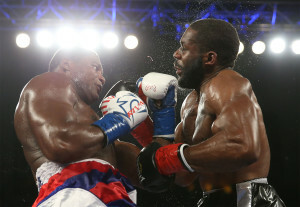 Still, his brave performance was a reminder that he was still the same top-rated heavyweight who rose through the ranks with a stream of spectacular wins, perhaps none bigger than his 7th round stoppage of Bryant Jennings in Dec. ’15. For the most part, it has been a struggle to line up opponents for Ortiz. His southpaw style and high skill level isn’t exactly a matchmaker’s dream, so he remains grateful for any opportunity that can come his way—even those that aren’t necessarily owed to him. The PBC brass could very well have their own agenda for adding Ortiz-Kauffman to the show; historically, a good heavyweight fight belongs anywhere, regardless of its future implications. Ortiz’ motivation is simple: win big, and begin 2019 with a fresh pursuit of the only heavyweight titlist he believes will take on all comers. The latter part is an obvious dig at Anthony Joshua, the unbeaten, unified heavyweight titlist from England. There has been heavy demand for a Joshua-Wilder showdown, dating back to 2016 when Joshua won his first title and both heavyweights were part of the Showtime boxing family. Fast forward to 2018, where petty bickering still remains as the two sides continue to foolishly negotiate through the media while making little progress. “Joshua is a p***y so forget about him ever facing Wilder or myself,” Ortiz believes. “Honestly, my coach has a better chance of getting Joshua in the ring. I’m just going to focus on the guys that want to fight me—beginning with Travis Kauffman. Once I take care of him, I’ll clean up and grab a ringside seat for Wilder’s fight.